Journalist Lauri Kivi returns in a taut standalone thriller that takes readers to dizzying heights and the dark depths of the human psyche with Hiltunen’s inimitable storytelling. Journalist Lauri Kivi has much to be grateful for. A successful career reporting on serious crime, he has finally come to terms with his own difficult childhood and recently got to know his grown-up daughter, Ava, a promising young singer. But dark clouds gather on the horizon. Researching a piece on unsolved disappearances – including that of one of Ava’s predecessors, Amanda – Kivi finds himself unearthing facts of Amanda’s disappearance that will threaten not only himself but also Ava. Will he be able to save both Ava and himself, before it’s too late? 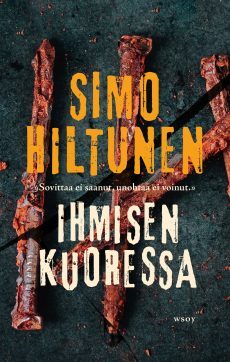 Simo Hiltunen (b. 1977) is a journalist and visual producer from northern Finland. His debut In Sheep’s Clothing was published in 2015 to great acclaim. English sample ca. 40 pp.